Deep Thought Pub: Coming Home to the Wild Goose! Coming Home to the Wild Goose! Despite the oppressive heat, last week’s Wild Goose Festival in North Carolina, proved to be a refreshing respite for my wandering soul. I went there to promote my newly launched book and discovered something I have sorely missed of late: a dynamic like-minded community within a progressive Christian movement devoid of religious overtones. I had a honkin good time at Wild Goose! First, there were the surprising parallels with my big idea. I thought my book (Confessions of a Bible Thumper) was unique with its craft beer theme—which anchors my spiritual evolution in a pub and uses microbrews as a metaphor for true freedom in Christ. But as my daughter Beth and son Nate helped me set up our book booth, no more than 100 feet away stood the beckoning beer tent run by a popular Durham microbrewery! As I perused the schedule, my eyes locked on sessions entitled “The Theology of Beer,” and “Beer and Hymns.” Hmm… my kind of festival! I mused. Before long I found new friends like Pastor Jimmy Chalmers, known for praising God for hops and brew techniques as much as grace. And Bryon Berghoef, author of the forthcoming book, Pub Theology, about his experience connecting with God and friends in pubs and other unlikely places. 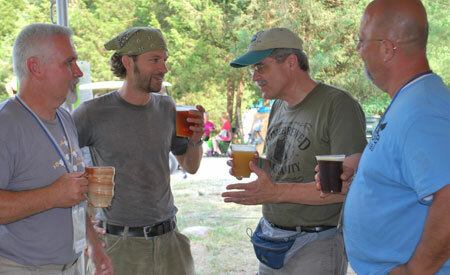 Here we are below discussing the future of microbrew theology and attitudes in the church. Despite the incredible interest in my book—amazing conversations and half-decent book sales—I found it more challenging and inspiring learning from workshops and making connections. Nikole Lim shared how she used photography and video to start a mentoring and scholarship program (Freely in Hope) to help women in Kenya affected by sexual abuse and poverty. Roger Wolsey, author of Kissing Fish, had an excellent session on The Progressive Reformation. Not only did I hear Frank Schaeffer speak (he had endorsed my book), but finally met him and his wife Genie. Phyllis Tickle spoke on the history of Christianity and how every 500 years a reformative stream arises in society. We are in one now, she says, called the Great Emergence. Finally, there was a sneak-preview of portions of a new film called Hellbound? that is due out this fall (I was unable to see it but there is a trailor, which you gotta see!). As does the Universal Life chapter in my book, it dissects and debunks the doctrine of hell and the churches that teach it. I also met and had a delightful conversation with Rich Koster of the Christian Universalist Association (I love this guy) and Eric Elnes of Darkwood Brew. If you attended Wild Goose, I’d love to hear your experience. If not, I highly recommend it and if out West, do attend Wild Goose West in Oregon this coming Labor Day weekend. If you resonate with emergent, progressive, or convergence Christianity, attend Wild Goose and support this amazing now-annual festival—a needed answer to the partisan and polarizing Christian Right and standard evangelical fare. I welcome your comments. It was good to meet you and Wild Goose feels more like home than most any place.Catholic Worker social justice and Sufi/Franciscan/Emersonian spirituality. Fun and informative reading, plus some beer and wine recommendations. No, I'm not, but will definitely check it out. Thanks for the recommendation!